The Holiday season is terrific for shopping with great deals all around. Here are the top 10 best Christmas decorations under $50. Every season comes with new great finds and new opportunities to grab that unique decoration or accessory for pennies on the dollar. This year is no different, and we’ve gone ahead to find some great stuff for Christmas decor, all for under $50. Check out our top 10 list and be sure to use any opportunity you like. Some of these items are really unique and dirt cheap. Enjoy! Do you feel that your table decor for Christmas is lacking? Christmas wreaths, pinecones, and centerpieces might be classic, but they’re not necessarily enough. 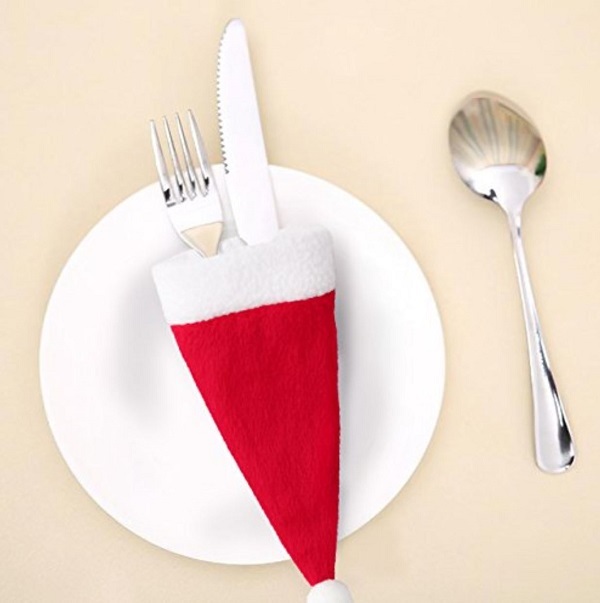 When it comes to unique decor, these Santa Hat silverware holders are among the most whimsical accessories you can get. They will look pretty cool during the Christmas dinner. And hey, when all is over, they can easily double as Holiday hats for your beloved pets. We can think of several other decoration opportunities with these little hats as well. Continuing the Santa Hat decor theme, these chair covers are adorable too. They go well with the silverware holders and make unique dinner table decor. If you still need more ideas on how to decorate for your Holiday dinner, you need these chair covers. Not only that, these Santa Hats can be used anywhere around the house as a Christmas decor feature. You can use it as part of your decor vignettes. They will fit any chair in the kitchen, dining room, bedroom and bring the Holiday cheer into every room. This decoration takes a little bit more investment and involvement, but it’s quite spectacular when installed. The snowman porch light covers add that whimsical touch to your porch Christmas decor, and it’s worth the effort. Who doesn’t want their outdoor Holiday decor to be unique? The covers come in pairs, so the idea is to fit them on each side of the front door. These snowmen are so cute that you will want to keep them even with Christmas over. Pack them up, and you’ll easily re-use them next season. We all know how wine bottles can be perfectly used as DIY home decor. And Christmas time is not any different. You can use wine bottle crafts to add decor value to your vignettes and displays. So, for this, you have these lovely Christmas bags for bottles. These covers can be used as gift bags as well as decorations. They are inexpensive so you can get them for all occasions. Christmas crafts have never been easier before! This has to be the most adorable find for Christmas decorations on the list. The set of 6 reindeer brings all the Holiday joy to the table. After all, there can be no Christmas without the reindeer (who else will drive the Santa’s Sleigh.) As candle holders, they will bring tons of charm to any vignette or display. For a set of 6 items, these candle holders are rather inexpensive. They are made of iron, and the bronze finish is a warm decor feature. What a lovely Christmas decoration it is. If there’s one thing you can never get enough in home decor, it’s the accent pillows. So come Christmas, you need a few of these throw pillows for the Holiday decor. These particular pillows are really lovely. They come in gold foil print art (snowflakes and word art) which looks very festive. As they come in sets of four, you can get them and use them around your home for that touch of Christmas. They look modern and stylish. If you get anything from this list, get these accent pillows. For those of you who didn’t make their own DIY Christmas wreath or didn’t want to make one, these are charming pre-made wreaths. You can get them on Amazon without any hassle. A great deal, if you ask us. You can choose from a few different styles, and no-one will be the wiser. To take it even further, we do suggest you take on a little DIY project and customize these wreaths. Use a purchased wreath as the base and add extra decorations. Choose something from the currently trending Holiday decor ideas! Paper snowflake garlands are a DIY classic. Everyone knows how to make them with paper crafts. But not everyone is willing to do it because let’s face it; it can be quite an involved project. Indeed, if you want to make intricate snowflakes, you have to clock in several hours worth of crafting. As an alternative, you get these beautiful 3D paper snowflake garlands. They are cheap, and they are detailed. Your Christmas window decor needs them. Taking the paper garland idea further come these stylish hanging swirl snowflakes. The design of them is cut out card snowflakes on metallic swirls. It’s taking the paper garland crafts up a notch. If you like modern Holiday accents in your home decor, these decorations are it. You can hang these swirls anywhere, and their modern style will fit anywhere too. Be it on the Christmas tree, your Holiday mantel vignette, dinner table accents or even entryway greeting decor. Versatility is the main attraction of these decorations. We consider these pendant snowflakes a terrific find because there might be no better way to decorate your chandeliers and lighting fixtures. Hanging from the ceiling these pendant snowflakes (which come in a few different colors) are nothing short of Christmasy, and they will make a beautiful snowy scenery. These decorations are cute as they are cheap and made of decent quality paperboard. It provides them weight (as opposed to paper snowflakes) and visual interest.